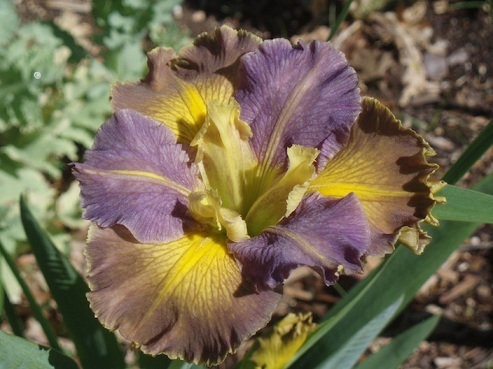 Of the many color patterns available in bearded irises perhaps none is so striking as that of the 'broken color' varieties. In color breaking, a genetic instability causes the colors and/or patterns of the iris to express irregularly giving a flower that is splish-splashed in a more or less haphazard fashion. 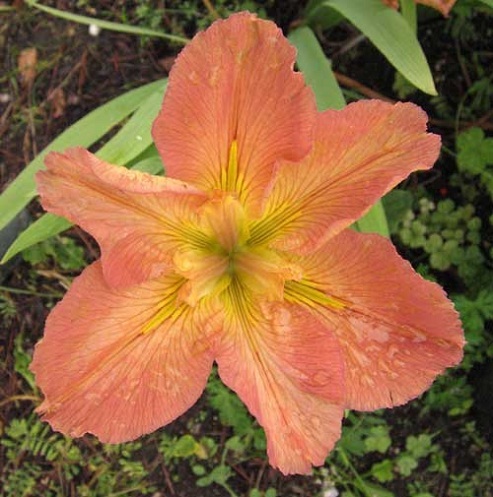 No two blooms are ever just alike, and they can create a very lively and exuberant effect in the flower garden. Visitors that are unfamiliar with them always exclaim over the novelty. I'd like to share with you some of the varieties I have enjoyed over the years. First up is a very old French variety now called 'Victorine'. It was likely introduced by Lémon back in the 1840s under the name 'Victoire Lemon', named for his mother. 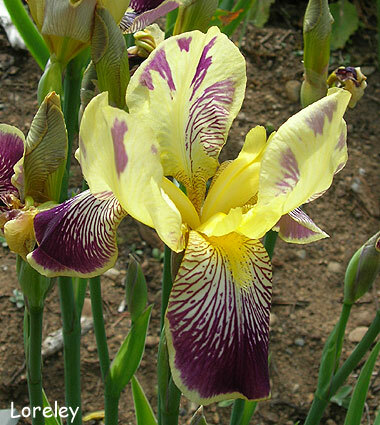 The names were later confused and this iris in now grown in the US as 'Victorine'. 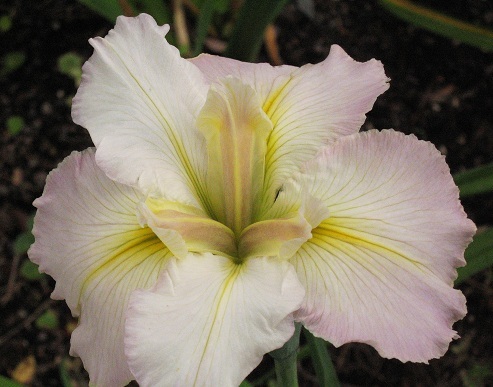 A charming diploid variety in the amoena pattern with rich purple falls edged white under clean, white standards which are splashed on the inside of the petal with the dark purple of the falls. Very striking. 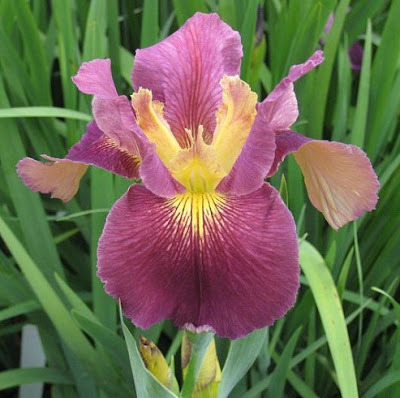 Another classic from the earliest days of iris hybridizing is one of the most widely known and grown: 'Loreley' by the German firm Goos & Koenemann, introduced in 1909. 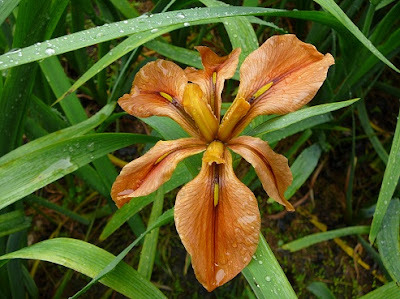 This is a very tough and hardy iris, and is widely grown as it can thrive just fine in neglected situations. 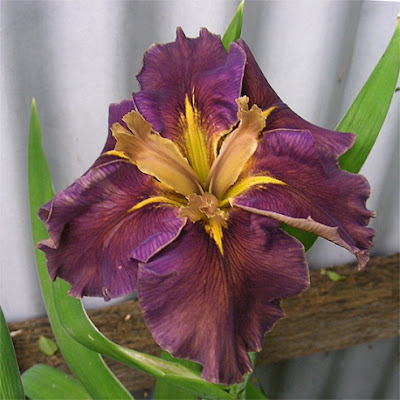 Not the prettiest for form, it is nevertheless treasured for its beautiful colors. The falls are purple veined white and edged golden yellow, while the golden yellow standards are wide open and flecked with bits of the fall pattern - not just the purple, but the white striping too! Very unusual. Next up are two varieties introduced by A.B. Katkamier. Both are sports in the 'Honorabile' family. This family of sports is widely known for its breaking of color and pattern. The novelty has made them very popular with collectors, who are always on the lookout for a new sport to appear in their beds. First up is 'Kaleidoscope' from 1929. 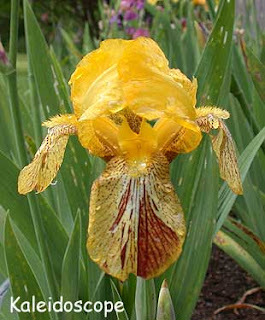 A beguiling Miniature Tall Bearded flower with deep golden standards over lighter yellow falls that are splashed with shards of red and white. 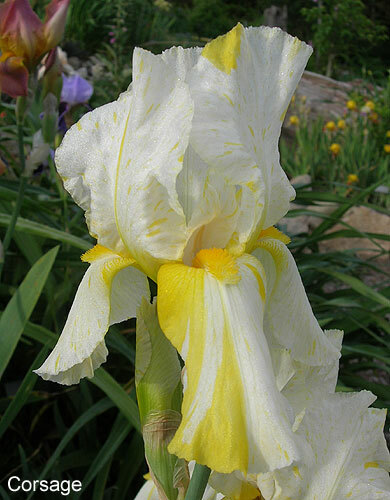 'Joseph's Coat Katkamier' is a merry madcap of color with white, yellow, violet and red all appearing across the bloom in irregular profusion. This one was introduced in 1930, but was not officially registered until 1989. I think a clump of this in bloom adds a very whimsical note to the garden. You can learn more about this family in Jean Witt's article Notes on Honorabile, along with an excellent follow-up by Clarence Mahan on the HIPS website. In 1956 Edward Watkins registered 'Corsage', his new variety that had been introduced the year before by Tell Muhlstein. 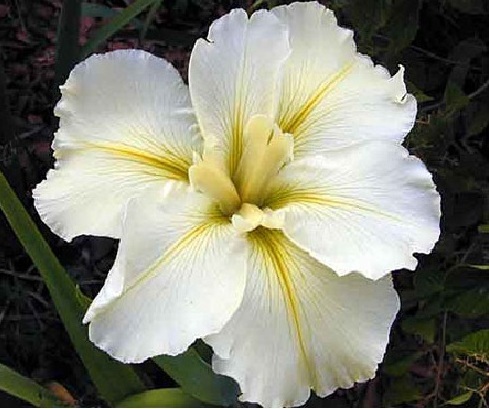 A frothy confection of white and lemon yellow haphazardly arranged so that no two blooms are alike. It's lovely grown in a bed with pastel pinks and blues. 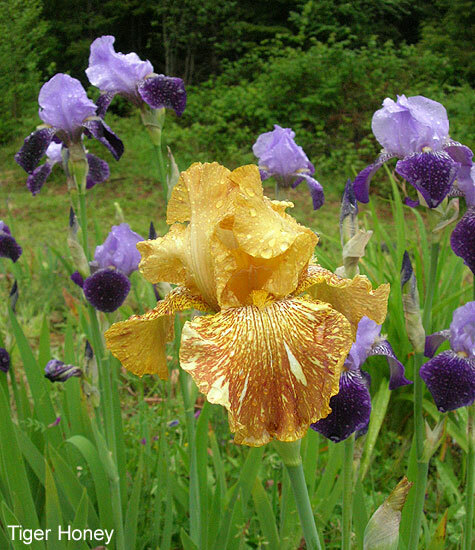 Another variety in almost the same color tones is 'Buttered Popcorn' (Palmer, 1970). This time the large ruffled blooms are creamy white drizzled with a soft, buttery yellow all about the standards and falls in a subtle drip-like pattern. The name could not be more perfect. 'Minnesota Mixed-up Kid' is a charming Border Bearded variety that has been known and grown since the early 1970's, tho it was not officially registered until 2003. It always makes me think of birthday parties with its lively coloration. 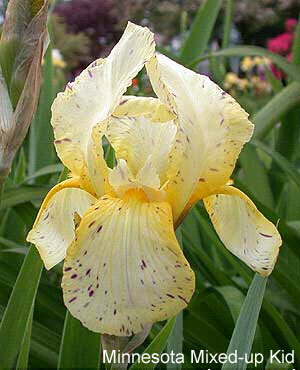 A cream toned bloom deepening to golden yellow at the heart and speckled liberally with fuchsia freckles. 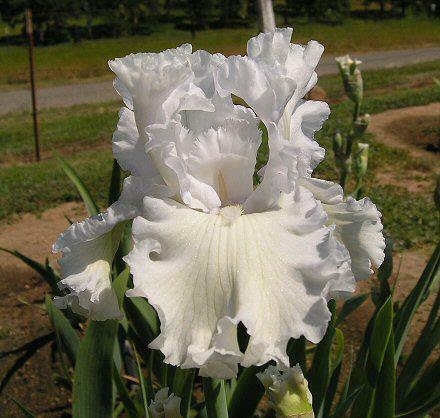 An excellent grower and reliable bloomer, it elicits attention from every visitor. 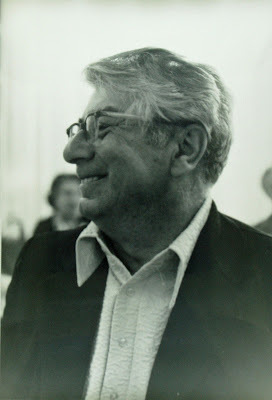 In 1986 Allan Esminger introduced his new creation which went on to win award after award culminating in the Knowlton Medal in 1992. 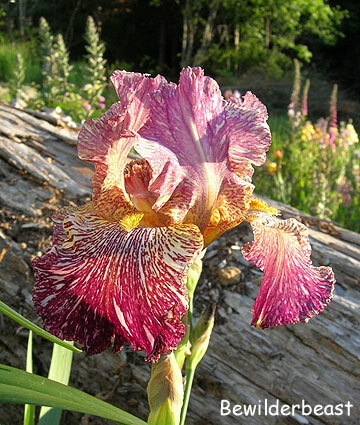 It is perhaps the best known broken color iris around today and is extremely popular with the gardening public. 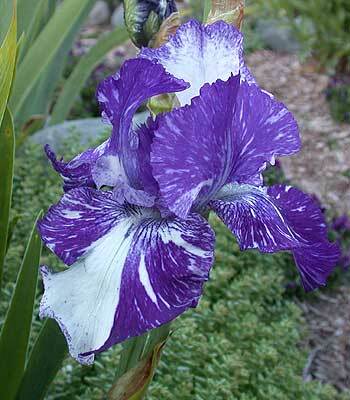 Big ruffled flowers are grounded white and heavily lined with royal purple. 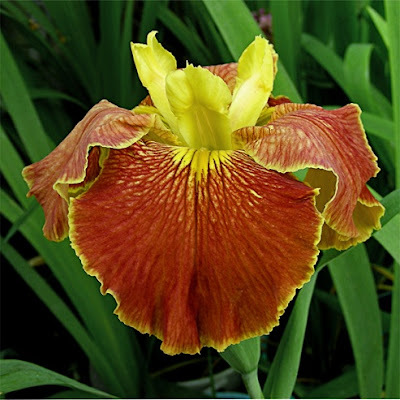 An excellent grower and bloomer, it is also known to occasionally sport a plicata bloom or two. In this pic you can see one of the standards and part of a fall are showing white edged purple. 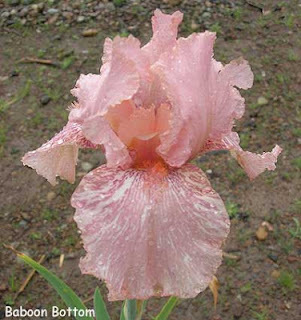 'Batik's' awards and acclaim inspired others to start hybridizing for this broken color trait and in the 1990's Brad Kasperek began selling new varieties of his creation out of his aptly named Zebra Gardens, in Utah. 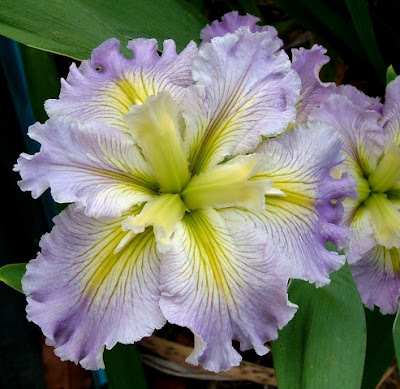 Using a combination of eye catching flowers and creative names he really made a mark on the iris world and established this pattern as a real presence in bearded irises. One of my favorites of Brad's is 1993's 'Tiger Honey'. A beautifully tailored flower of honey-gold striped lighter gold and cream white. I don't grow many modern irises but I'll always make room for this and the following two Kasperek varieties. The amusingly named 'Baboon Bottom' is an Intermediate Bearded iris of Brad's from 1994. An old rose pink striped and splashed light pink and white, it has not been the best grower for me in the cold and wet PNW but it manages to show off for me every few years and is always welcome when it does. It won the Knowlton Medal in 2002. 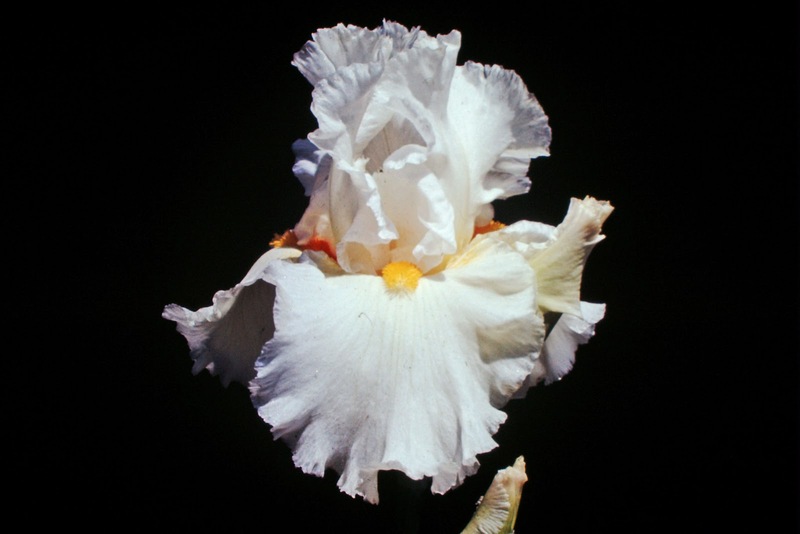 I'll leave you with two photos of my favorite of all the broken color irises I grow: 'Bewilderbeast', from 1995. An extravagant flower with falls of cream white ground and yellow shoulders all heavily striped with a rich deep mauve; silvery white standards are striped lighter mauve. 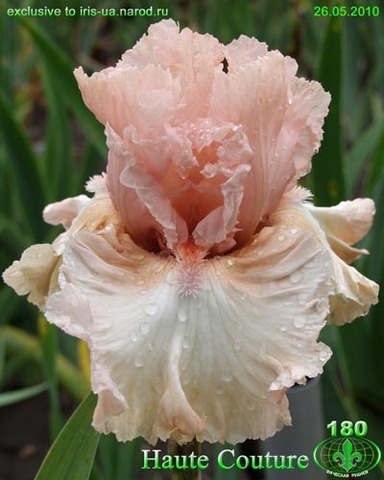 A reliable bloomer and excellent grower, a clump of this is easy to achieve and stunning in full bloom. I would love to have seen this one win the Dyke's Medal. 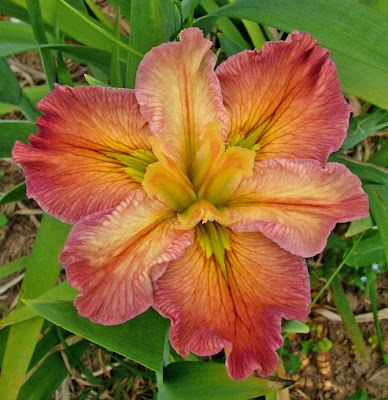 I hope you've enjoyed this peek into a few of the varieties showing the unstable genes now known as the Broken Color pattern. Maybe you'll add a few to your garden, or share the ones you're growing now on our Facebook page. If you're looking for more on historic irises please visit the HIPS website. The latest edition of our eZine Flags is now available for download. 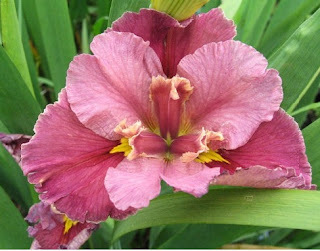 The 28th calendar of The American Iris Society celebrates the great diversity of both people and plants within the iris world. 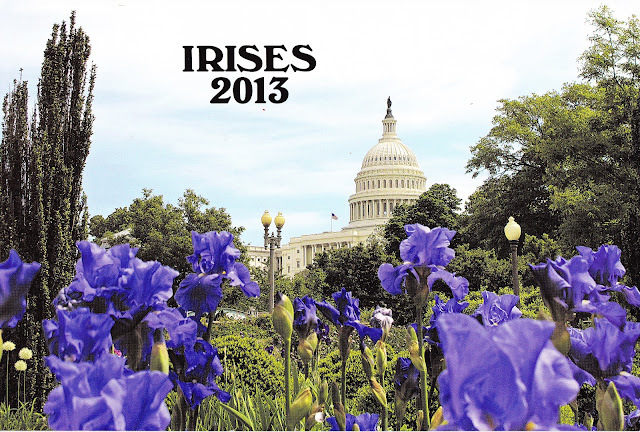 If you are looking for "something iris" to give your loved ones this year as a holiday gift, for a year filled with inspiration, we recommend the 2013 IRISES Calendar -- available now on the AIS Storefront. Price is $7.00 plus S&H (USA $2.00, Canada $3.00, International $5.00). Pack of 10 for $50.00 plus S&H (USA $5.00, Canada $9.00, International $18.00). S&H is in addition to item price. Affiliates and iris clubs, please visit the Storefront online for more information. PO Box 956, Sandy, Oregon 97055. Payment can be by check, money order or credit card (VISA or Mastercard only). Minimum credit card order - $10.00. 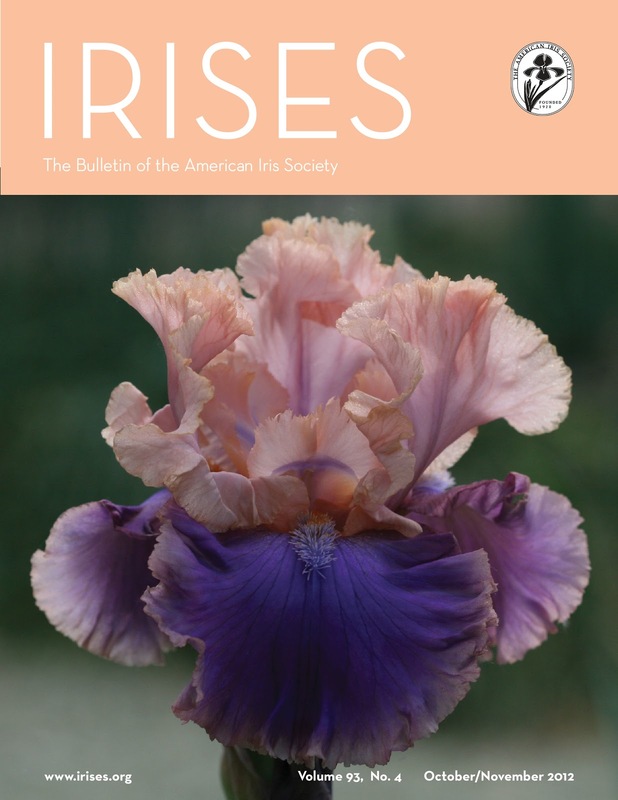 I hope you are member of The American Iris Society at this time, because it means that you will receive the new issue of IRISES, the Bulletin of The American Iris Society, either in the mail or digitally (if you are an e-member). This issue's cover features the 2012 Dykes Medal Winner, 'Florentine Silk,' by hybridizer Keith Keppel. 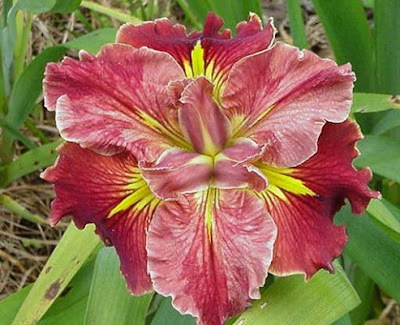 What an amazing looking iris it is. Do you have it in your garden yet? So, what do we cover in this issue? Here are a few sections that caught my attention. For starters, our AIS President Judy Keisling gives a tender and kind reflection on her years as head of the society, and reviews some memorable moments. Editor Kelly Norris explains the virtues of the new column, Standard and Falls. Jim Morris, current VP and incoming AIS President says adieu to an attentive audience in his column about News of Sections & Cooperating Societies, and introduces us to the new AIS 1st VP and column writer. AIS Marketing & Public Relations Co-Chair Bob Pries writes a detailed and informative article on Frequently Asked Questions About E-membership. The complete list of 2012 AIS Awards Winners is published as well as accompanying pictures. 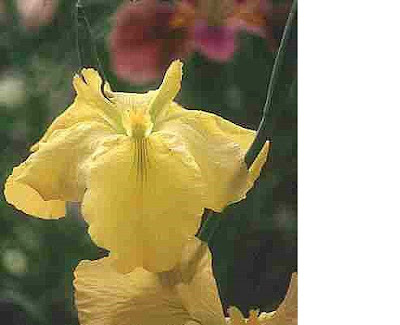 Australian hybridizer Graeme Grosvenor's 40th year of hybriding tall bearded irises is reviewed and major accomplishments detailed. And also worth noting is Australian hybridizer's Barry Blyth's article on Garden Judging and Breeding Principles. There's so much more. Hope you will have a chance to read and be delighted with this new issue of IRISES. Oops, I did it again. I know it has happened to almost everyone. 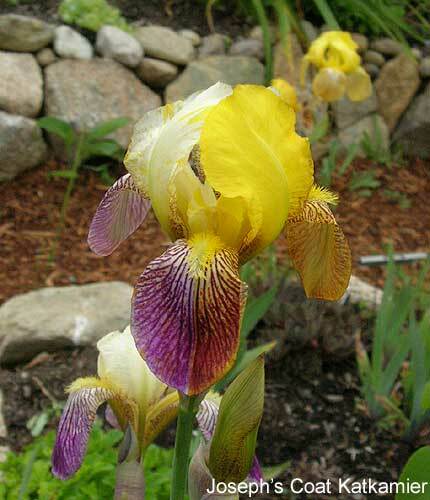 You pick up a few irises at your local sale and set the bag aside for planting later. Or maybe a box arrived when you were busy and was misplaced. Out of sight, out of mind. Then, on a late Fall day you stumble across them. Horrors, are they still alive? Do I dare look in the box? What do I do with them NOW! 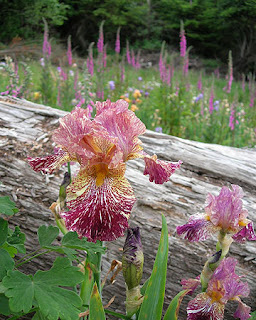 If they are bearded iris then they are most likely fine. They are not happy by this time, though. Don't expect flowers next Spring, but there is an excellent chance you can save them. You have to plant them, right away, even though it's the wrong time of year. Don't wait until Spring as they will be even weaker by then. They will sprout roots very quickly after planting as the soil is cool and moist this time of year. They will not have time to grow enough roots to withstand the rigors of the coming Winter without a little help. Fortunately, there is a very easy and reliable method to protect them through this precarious predicament. Plant the iris as you normally would in your climate. I have heavy clay so the rhizomes are just barely covered with soil. Then place a brick or flat rock immediately behind the fan on top of the rhizome. I usually leave the old foliage on until early Spring when I remove the brick. I have rarely lost an iris doing this unless it was actually dead by the time I found it. Some people suggest a thorough soaking and a quick rinse in bleach water before planting but I haven't found that necessary. If you have a lot of irises to plant this way you can cover the rhizomes with a 2 x 4 board weighted at a few spots with bricks or stones. This even works with beardless irises but must be modified a tad. After planting place a brick on either side of the clump, close to, but not covering the new fans of foliage. 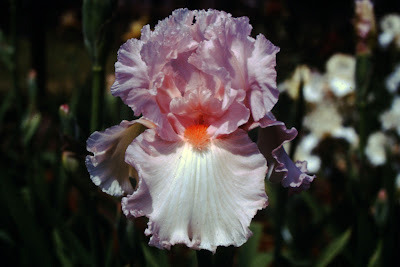 This is one of the first things I remember learning after joining the Greater Kansas City Iris Society. 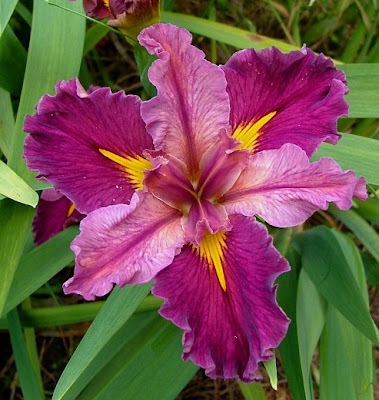 Belonging to a local iris club is the best way to learn tips and tricks for growing irises in your area. 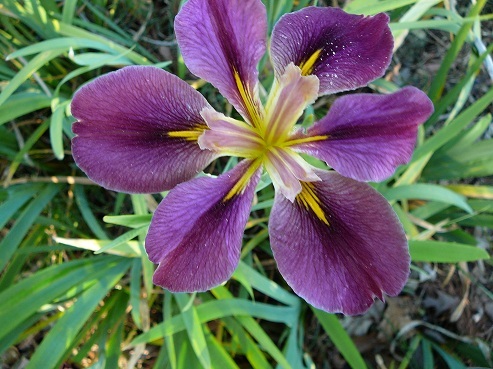 One of the most striking things about Louisiana (LA) irises is the diversity of flower form and size. 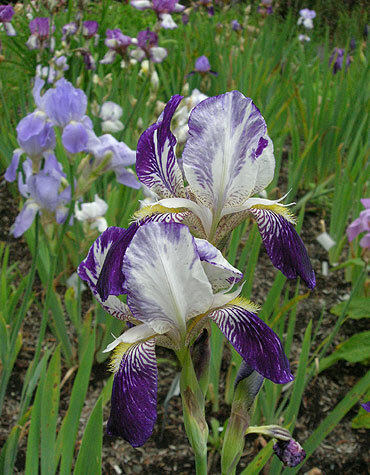 And although some iris species are divided into different height or size categories, LA irises are not. They can be as short as 1-2 feet tall all the way up to over 6 feet tall. Furthermore, LA irises are generally divided into nine different flower forms. Some fall into more than one category, however. For example, the flower forms "fully overlapping" and "ruffled" can often be combined to describe some of the more recent and spectacular hybrid LA irises. 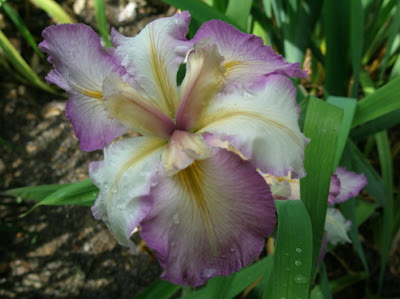 So let us take a look at some of the LA iris forms. Another form that represents more and more of the recent hybrid LA irises is the "ruffled form". Most irises in the "ruffled form" also tend to fall into the "overlapping" form. Here are some examples of the "ruffled form". The "umbrella pendant" form is somewhat similar to the "recurved form" but in the umbrella form the falls and stands fall down very close to the bloom stem. Again, it was difficult to find good pictures of this form. The "semi-double form" is often called the "cartwheel form" and represents a bloom that generally has all falls and no standards. There is a difference between "double form" and "cartwheel form" but the difference goes beyond the scope of this article. 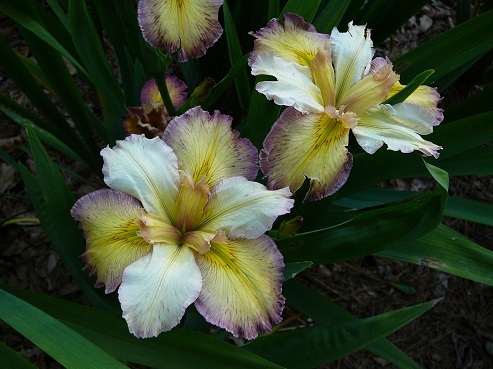 There are very few LA irises like this, and a number of hybridizers are developing irises of this form. The "overlapping form" is by far the most common in modern LA iris hybrids. In this form the standards are quite large and the standards lie flat against the falls forming a dinner plate effect. Here are some beautiful examples of the "overlapping form". The "open form" is without a doubt the most common form of the species LA irises and of the early hybridizing attempts. 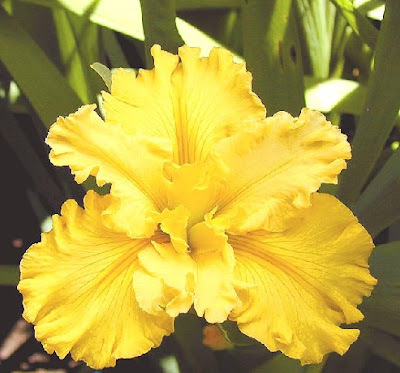 It represents a form still cherished by LA iris lovers and flowers with this form still win major awards in bench judging. 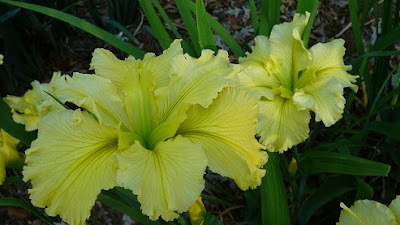 In the "open form" the standards are usually small and the falls tend to be much smaller than in recent hybrids. This gives a lot of space between the petals and thereby the "open" form. 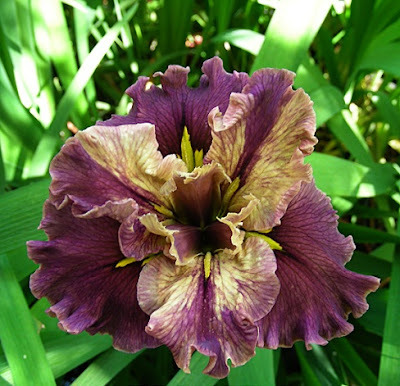 The Society for Louisiana Irises does not officially recognize the following flower form but I think it should be added, since more and more LA irises are like this: the "overlapping and ruffled" form. 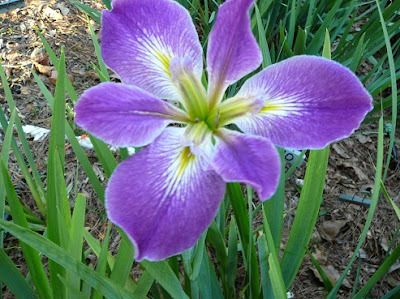 Here are some irises I think would fit into this category. 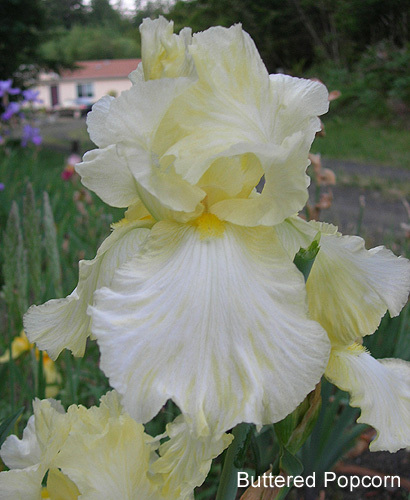 The real beauty of LA irises is their diversity of shapes and sizes. 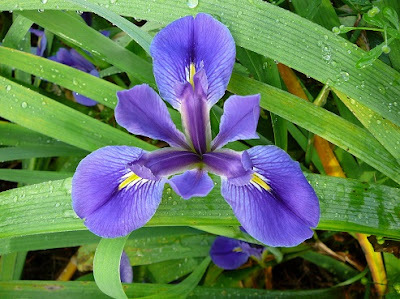 The size of the iris with a bloom stalk can range from a couple of feet to over six feet, and the size of the blooms can range from a couple of inches to over eight inches across! Surely you can find a bloom you like. Which form is your favorite, and do you grow it in your own garden?